We are not ... romantic scientists interested in fantasies ... that pretend to re-insert the Aether in Science because many thousand of persons proceed in that direction ... We are Scientists that know Aether exist, have speed, density or elasticity and is bound the Light ... which have not a fixed or constant speed ... but variable. Just here we count two facts (Aether+Speed-of-light variable) ... in direct opposition to the Postulates of Einstein Theory. There are millions of Extas inside any Electron and there are a relation between "Extas" and "Grams of Prana". Do you know what is Prana? ... Prana is which Akasha ... another of the fundamental forces of the Universe ... discovered ... to use these words by Nikola Tesla ... in his latest researches. Paul Drude ... a German Scientist release ... "The Physics of Aether" in German. Also Prof. Albert Einstein consider Aether existence at the beginning of his research. 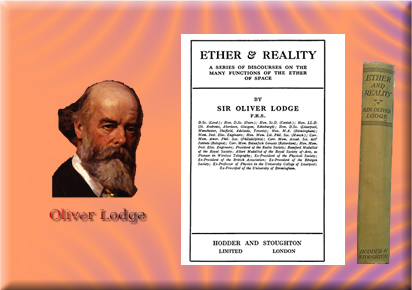 But let us today talk a little about Prof. Oliver Lodge. Prof. Lodge like Isaac Newton (because he really study Newton ...) enter Aether in Reality ... Matter ... others enter with Gravity ... and like Drude with Electromagnetism and Magnetism. Therefore we now have here ... someone from the Western School (from some perspective the only one ...) while in Eastern School like in India ... Aether is one of the Brothers of the Four Elements: Water, Fire, Air and Earth.